After a full session of number crunching—horizontal and vertical measurements of the Mr. Greenjeans sweater pattern—my Sweater Workshop students were chomping at the Cast On edge to get started on the real thing. The next session is in two weeks so I thought I'd keep a visual diary on my sweater's progress. Here is the first day's progress. 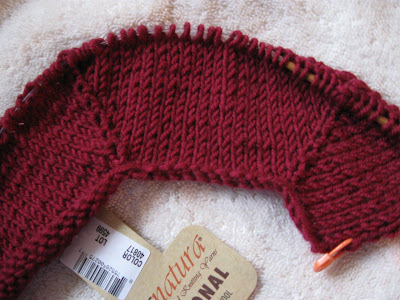 Mr. Greenjeans Sweater; top-down construction with raglan shaping. Day 1: Cast on. Begin the 6 row sequence (marked with split stitch markers). 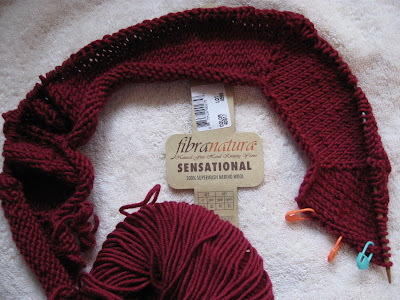 Yarn: Fibra Natura Sensational, color: Anemone. One stitch double increase at raglan sleeve lines. I've changed the pattern's raglan increase stitch [yo, k2, yo] to something less lacy. My double increase is [k1, k1b, k1] all in the same seam stitch. I did a bit of adjusting on the placement of the increases as the pattern's double increase occurs across 4 sts while mine uses 1. ATCs: Who's who in the Zoo?